Kamdor - Long Live the Power Rangers! An ancient ninja that was imprisoned inside anecklace that came in the possession of Miratrix. Even though he was trapped inside, he could releasemonsters to fight the Rangers. Miratrix sought out a device to release him from his crystal prison. Will helped Miratrix steal the device and they ultimately released Kamdor. When Miratrix was knocked flying by the Fearcats, he sounded genuinely concerned. However, he still didn't view her as an equal and left her out of the details of some of his plans by organizing an alliance with Flurious without her, and sending her against the Rangers while he searched for the jewel, without telling her. He told Miratrix he was tired of her failures and stated she was only an underling and he'd been a fool to believe she could be more. He angrily beat the Mecury Ranger into unconsciousness. He then made his final move in waiting for the Rangers to do the hard work and successfully stole the Golden Plate that led to the fifth jewel. Call forth a meteor to Earth with the third jewel as a diversionary tactic, and Will faced Kamdor in a solo duel while the other Rangers handled the meteor crisis. Kamdor switched to his Duel Mode, revealing his true face to Will. Kamdor also imprisoned Miratrix in the jewel that had once held him. 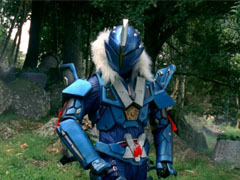 Kamdor was eventually destroyed by the Black Ranger, and the Plate was retrieved. When Dax first met her, she looked like an ordinary monster-victim and she said her name was Mira. He soon became enamored with her and they saw each other quite often. Dax did not want to believe his friends that she would betray him until he noticed a monster appeared every time she was there and she mentioned they were looking for the Corona Aurora which he never told her. Miratrix soon showed her true colors, she had a necklace that contained Kamdor and much like she played with Dax's emotions, she was seduced by Will. She served Kamdor loyally. Although it didn't last when she was order to fight the Rangers while he searched for the fourth jewel; feeling as if Kamdor was not forthcoming with all of his plans. She considered herself an equal in their partnership, whereas Kamdor actually treated her as a subordinate. After an unsuccessful attempt at reclaiming the Octavian Chalice from the Rangers, Kamdor made Miratrix see where she fit in the schemes of things. In retaliation, Miratrix interrupted the ceremony the Rangers were holding involving the Chalice, attempting to gain its power. 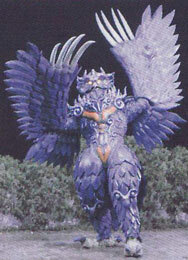 She was transformed into a giant owl-like monster due to its energy, and in this form had enough power to take down the BattleFleet Megazord. Ronny and Tyzonn managed to break her connection to the Chalice. After reverting back to a human form, Kamdor revealed he had been using her to do just what she had done, and imprisoned her in the jewel he had originally been sealed in. The location of the jewel holding her is unknown.